For the next couple weeks i'm going to start doing stat predictions for certain Lions players. Players like Stafford, Tate, Abdullah, Ansah, Slay exc... will get an in depth analysis of what I think their 2017 season could look like. I'm going to try and dive into every aspect I can and get out the best possible stat predictions that I can come out with. Up next, Theo Riddick. 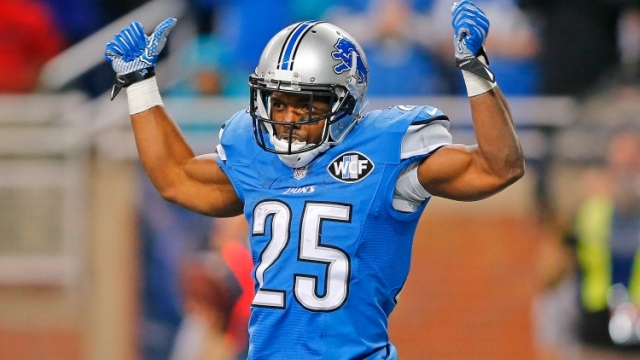 Quick Thoughts: Is Theo Riddick's skill set becoming obsolete? I was listening to a podcast one after noon and this podcast came up with the hot take that Theo Riddick was overrated. At first i brushed it off as nonsense but if you think about it it actually makes sense. In no way am i saying that Riddick is a bad player or even that he shouldn't get touches. But from what I've seen he has proven that he is not a capable runner. Sure he can spring a few big runs here and their but all in all he's not Detroit's answer at running back. And because of Riddick's inability to run the football teams have caught on to his one dimensional style of play. Theo Riddick may be one of the best pass catching backs in the NFL and maybe even one of the better ones all time, but that's all he is. So I don't expect the Lions to run Riddick that often, 55 touches might be the max amount of touches he gets. And because of his inability to really run I could see it being difficult for him to top 300 yards. The passing game however is a different story. Even if teams have caught on to his style of play he still can spring big plays. I'm hoping that Riddick gets around 75 touches in the passing game where he is best used as more of a wide receiver then a running back. I'm also expecting him to top 500 yards in the passing game. Along with that Riddick does have the ability to get into the end zone so I could see him getting 4 or 5 receiving touchdowns. Riddick has never really had a problem with holding onto the ball either, so i'm predicting 0 fumbles. When It comes down to it I still think Riddick can be very effective in third down situations and the passing game. He's a great weapon for the Lions but I personally am not expecting Riddick to have a huge statistical season in 2017 unless someone gets hurt.